On Monday 28th August, a good turnout of 16 players participated in the annual Eglinton Cup in the first event of the season. Players opted to play in eight pairs in a knock-out format. All players were allocated a handicap, with all games being played up to 31, other than games involving Michael, which were played up to 26. The first round saw two 3-2 victories which would have been reversed had a single point gone the other way. 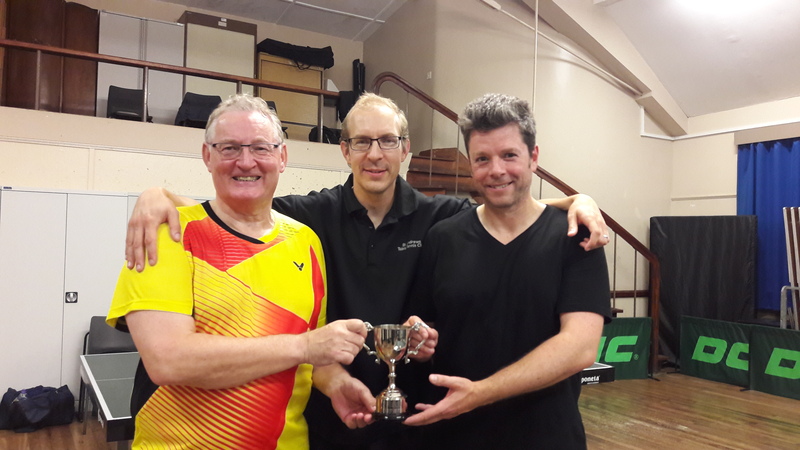 Howard Lee and Ian Brumwell defeated Michael Hahn and Emily Howat, and Dave Beveridge and Kong Wan defeated Emma Bissett and Rob Brown, with both matches including a game won on a sudden-death point (26-25 and 31-30) which proved decisive. The final saw Dave vie for his third consecutive title, an unprecedented feat. However, Sascha Roschy and Sandy Pearson went on to defeat Dave and Kong 3-0 in the final. Club chair-person Alain Leger and Ken Falconer secured third place with a tight 2-1 victory over Howard and Ian in a match which witnessed two 31-30 scores, and one 31-29. Robert and Emma won the ‘consolation’ half of the draw, securing fifth place after defeating Graham Wood and Neil Lea 2-1, whilst Collin Bleak and Dave Goddard took seventh place, with Michael and Emily taking eighth. Unofficial ‘player of the night’ goes to Sascha who went undefeated in singles, despite playing off a handicap of 5, the second lowest of the night. Special thanks go to Elaine Forbes who, as always, organised the tournament excellently. Her accurate handicapping was demonstrated by the number of tight games including five games which were won on a sudden-death point, seven 31-29s, and nine 31-28s. Attention now is drawn to the start of the competitive season, with the first fixtures for St Andrews’ five teams starting on Monday 11th September. See lots more action from the Eglinton Cup in 21 videos on the club’s YouTube channel. This entry was posted in Eglinton Trophy, Match reports, St Andrews Table Tennis Club on August 30, 2017 by standrewstt.